Spreading their wings: Author Joan Z. Calder, left, and illustrator Cathy Quiel are behind the new children's picture book "Airplanes in the Garden: Monarch Butterflies Take Flight." Here they frolic with the inspiration behind their book on a recent day at the Santa Barbara Museum of Natural History's "Butterflies Alive!" exhibit, which runs through Sept. 11. A love of plants fuels all kinds of passions, from an urge to tend dozens of pots brimming with flowers to the determination to cultivate native species. For some gardeners, it's the flitting critters attracted to those plants that trigger an irresistible impulse. For Joan Z. Calder, the greenhouse manager for Ecology, Evolution and Marine Biology at UCSB, the garden means butterflies, specifically magnificent monarchs. To share her enthusiasm for the orange and black beauties, she has written "Airplanes in the Garden: Monarch Butterflies Take Flight," complete with a compelling story, colorful illustrations, butterfly facts and even a song about the delicate creatures written and performed by local musician Rebecca Troon. Ms. Calder crafted the book for children ranging in age from 4 to 10, and described it as a nonfiction children's picture book. The text explains metamorphosis using accurate terminology in a fun, easy-to-understand way. "I talk about conservation and preservation, because habitat is being destroyed," Ms. Calder told the News-Press. "Bees are the No. 1 pollinator and butterflies are second. If we don't have bees and butterflies, we don't have food. It's important to help them." The story is seen through the eyes of a little girl named Bonnie who adopts two caterpillars in her garden. It follows the adventures of Sergio and Stanley (named for Ms. Calder's two lab assistants) as they transform from egg to chrysalis to butterfly. "I didn't want the caterpillars to talk," Ms. Calder said. "I really wanted a nonfiction story and it seems to be a hit with libraries, botanical gardens and schools, because that's the curriculum for first and second grade. 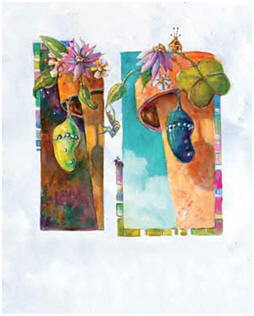 The watercolor illustrations by Santa Barbara resident Cathy Quiel capture the translucent quality of the butterfly. "Buyers are also grandparents who want to read it to their grandchildren," she added, "but the pictures are so beautiful, it's almost like a coffee table book." Santa Barbara artist Cathy Quiel created the illustrations using watercolor, an ideal medium because of its translucent qualities. With it, she conveys the transparency of leaves, flowers and butterfly wings in all their glory. "Not only is it a story about a little girl, but also it has information about the monarch, how to do a butterfly-friendly garden and the song, which is downloadable," said Ms. Calder. She first observed the monarchs on milkweed plants at the UCSB greenhouse. When visitors came through, she always pointed them out and found that both children and adults were excited by the process of metamorphosis. "One day, I had so many caterpillars, I took some home and named two after my student helpers," said Ms. Calder, who lives in Santa Barbara with husband John. "I said, 'Stanley, please make your chrysalis by my house or I'll never see you again.' I watched him go up and down the steps for an hour, and two days later, there was the start of the chrysalis under the patio table. I thought, 'This is a story I've got to write!' "
In addition to designing gardens, Ms. Calder offers seminars on her favorite subject, monarchs, including a free one 10 to 11 a.m. Aug. 27 at Terra Sol Garden Center. 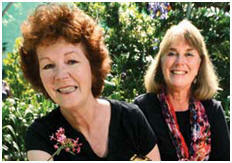 She also teaches "Creating a Butterfly-Friendly Garden" through Santa Barbara City College's Continuing Education. The next classes will be Sept. 14 and 21. She emphasized that butterflies need both a nectar source, such as Phlox, bee balm (Monarda), cosmos and many sages (Salvia), for the adults, as well as host plants for the larvae. These include milkweed (Ascelpias), lupine (Lupinus), Penstemon, hollyhock (Alcea) and common fennel (Foeniculum vulgare). Butterflies also require a reliable water source, preferably something shallow and muddy. "Butterflies taste with their feet," Ms. Calder explained. "It's called puddling. They like to stand on wet sand or mud, and they get the salt and minerals from the water. I'm hoping people will consider doing a garden, at least a couple of plants for the butterflies. "Monarchs have become my passion," she added with a laugh. "To think four years ago I didn't know anything about them and now, they've taken over my life!" K. Reka Badger is a Master Gardener and makes her home in Templeton. Email her at life@newspress.com. The children's picture book is not only entertaining, but educational. The text explains metamorphosis in a fun and simple way. 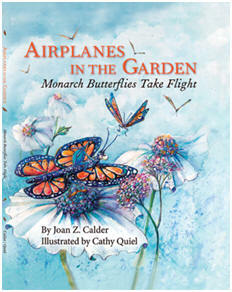 "Airplanes in the Garden: Monarch Butterflies Take Flight" (Patio Publishing, $16.95) by Joan Z. Calder, with illustrations by Cathy Quiel, is available at Chaucer's Books, 3321 State St.; The Book Den; 15 E. Anapamu St.; Santa Barbara Botanic Garden, 1212 Mission Canyon Road; Santa Barbara Museum of Natural History, Museum Store, 2559 Puesta del Sol Road; Tecolote Book Shop, 1470 East Valley Road, Montecito; Curious Cup, 929 Linden Ave., Carpinteria; and online at airplanesinthegarden.com. Ms. Calder will read her book 10:30 to 11:10 a.m. Sept. 17 at Story Time, for age 5 and older, at Goleta Branch Library, 500 N. Fairview Ave., Goleta. For more information, call 964-7878. She will present a free seminar on "Creating a Butterfly-Friendly Garden" 10 to 11 a.m. Aug. 27 at Terra Sol Garden Center, 5320 Overpass Road. For more information, call 964-7811. She will also teach "Creating a Butterfly-Friendly Garden" through Santa Barbara City College Continuing Education 7:30 to 9:30 p.m. Sept. 14 and Sept. 21 at the Wake Center, Room 28. Registration begins Monday at sbcc.edu/ce. Class costs $14. For more information, call 965-0581.